Following in the footsteps of last years' Splice of Heaven with Moon Dog and the tasty red IPA they conceived with Bridge Road, the staff at Beer DeLuxe continue to have the pick of Victoria's top breweries for their occasional collaborations, with their latest joint venture taking place at Boatrocker's Braeside home. 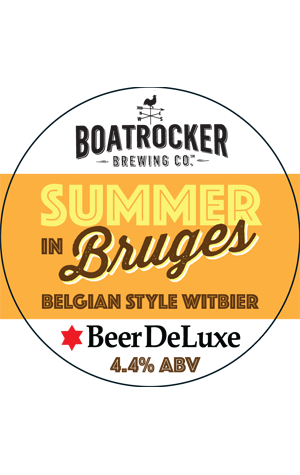 The aim was to create a beer appropriate for the hotter months which led them to the Belgian witbier style popularised by Hoegaarden, a wise move given Boatrocker's love of all things Belgian and with witbier being one of the few styles from that country they've yet to brew. Once discussions were underway, one staff member from Hawthorn suggested using native Aussie ingredients alongside those traditionally used in the beer. Thus in went lemon myrtle, fresh Australian navel orange zest, chamomile and coriander seeds, with the guest brewers kept refreshed with lashings of Gaston and Ramjet. The outcome, according to the BDL staffer who came up with the idea, is a beer he reckons is "pretty true to style and is tasting damn good. Nice and refreshing but with enough going on to keep it entertaining!"